Ali Shilatifard, PhD, chair and Robert Francis Furchgott Professor of Biochemistry and Molecular Genetics, was the senior author of the study that found a potential treatment for diffuse intrinsic pontine glioma. In research published in Nature Medicine, Northwestern Medicine scientists have found a molecule that stops the growth of an aggressive pediatric brain tumor. Every year, about 300 children under the age of 10 years old in the U.S. develop the tumor, referred to as diffuse intrinsic pontine glioma (DIPG), which is always fatal. “This tumor kills every single kid who gets DIPG within one year. No one survives,” said the study’s first author, Andrea Piunti, PhD, a postdoctoral fellow in the lab of Ali Shilatifard, PhD, chair and Robert Francis Furchgott Professor of Biochemistry and Molecular Genetics. No children suffering from DIPG have survived longer than one year. Northwestern scientists believe a new molecule may be able to buck that trend. Radiation therapy only prolongs patients’ survival by a few months, he noted. Shilatifard’s lab previously identified the pathway through which a mutation causes this cancer in studies with fruit flies, research published in Science a few years ago. He and colleagues believed the pathway would be a good target to thwart the tumor and pushed forward with their molecular studies. Shilatifard and Piunti collaborated with C. David James, PhD, professor of Neurological Surgery, Rintaro Hashizume, MD, PhD, assistant professor of Neurological Surgery, Craig Horbinski, MD, PhD, associate professor of Pathology and of Neurological Surgery, Rishi Lulla, MD, assistant professor of Pediatrics in the Division of Hematology, Oncology and Stem Cell Transplantation and Amanda Saratsis, MD, assistant professor of Neurological Surgery. Lulla, a pediatric neuro-oncologist, and Saratis, a pediatric neurosurgeon, respectively, are also at the Ann & Robert H. Lurie Children’s Hospital of Chicago. The scientists also are members of the Robert H. Lurie Comprehensive Cancer Center of Northwestern University. In a study with Hashizume’s group, they demonstrated that mice that had the drug delivered through their abdomen had an increased survival of 20 days, which is a long time in the life of a mouse, Piunti said. Now the team at Northwestern Medicine and Lurie Children’s is working on delivering the drug to the brain stem to see if the effect will be more potent. To test the molecule, scientists took tumor cell lines from a pediatric patient who was untreated and injected those cells into the brain stem of a mouse. The human tumor engrafted in the brain of the mouse. The mouse was then treated with the molecule while scientists monitored the tumor. The molecule stopped the growth of the tumor cells and forced them to turn into other types of cells, known as differentiation, thereby halting its growth. This molecule detaches proteins, known as bromodomain proteins, from their binding to a mutant protein, the histone H3K27M, which is present in more than 80 percent of these tumors. While the molecule itself is not yet available commercially, another similar class of molecules, BET inhibitors, is being tested in clinical trials for pediatric leukemia and other types of tumors. These could be used in a clinical trial for the pediatric tumor, Piunti said. 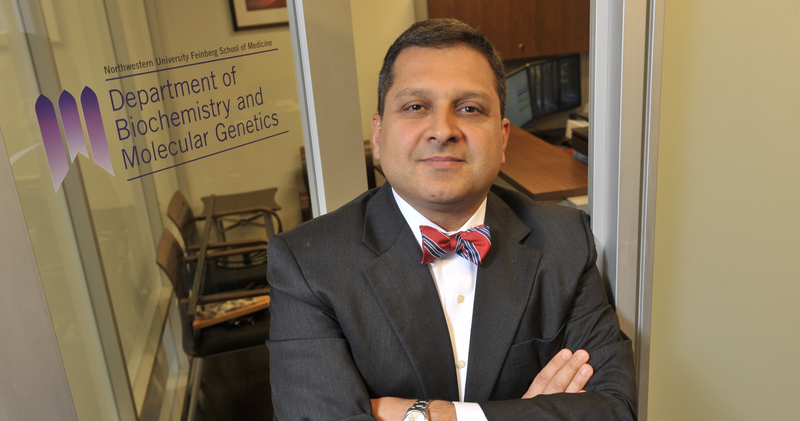 The collaborative environment at Northwestern made the discovery possible, Shilatifard said. Shilatifard’s other Northwestern collaborators are Neil Kelleher, PhD, professor of Medicine in the division of Hematology/Oncology, and at the Weinberg College of Arts and Sciences; Elizabeth Bartom, PhD, assistant professor of Biochemistry and Molecular Genetics; Alexander Misharin, MD, PhD, assistant professor of Medicine in the Division of Pulmonary and Critical Care; Marc Morgan, PhD; Stacy Marshall; Emily Rendleman; Quanhong Ma, PhD; Yoh-hei Takahashi, PhD; Ashley Woodfin; and Nebiyu Abshiru, PhD. The research was supported by grants RO1NS093079 and R35CA197569 from the National Cancer Institute of the National Institutes of Health.